Cold soup? Sure it sounds a bit strange to a culture that didn’t really grow up with it, but the Spanish can’t have been wrong for all these years! Gazpacho is an incredibly delicious offering, and just the thing for a light meal on a stinking hot day. I like it as cold as absolutely possible, so I even chuck in a few ice cubes at serving time and really ramp it up. 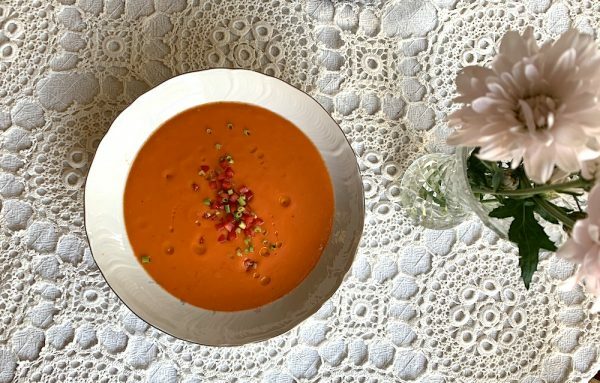 Gazpacho benefits from being made as far in advance as you can, so overnight would be minimum but if you can’t wait that long, an hour in the fridge should do it! Stale bread is perfect for this, but if you don't have any, dry out two slices of bread on the benchtop overnight or toast briefly - just enough for it to get dry, rather than brown. Break into small pieces. Blend the red capsicum and the red wine vinegar in a food processor until it is smooth. Add the rest of the soup ingredients and a splash of water into the food processor or blender and whiz until soup is smooth. Add water until it is the consistency you are happy with. Check the seasoning - it may need a little extra vinegar, salt, or sugar, depending on how ripe your tomatoes are. Refrigerate for at least an hour or preferably overnight. Serve chilled in shallow bowls with the garnish extra for people to add as they wish. Dice all the vegetables very finely into tiny cubes (or slices for the spring onion), only a couple of millimetres in size.